This cover turned out very different from what I originally had planned. When I was creating the illustration for 'Silver Nemesis' I thought the same composition would work for 'Revenge', with Kellman and Vorus in the places of Peinforte and DeFlores, and either Voga or Nerva Beacon providing a background shape as the Earth did on the former cover. 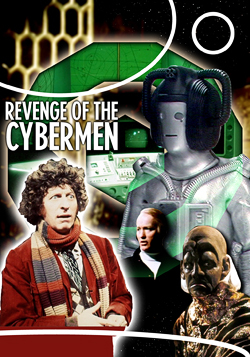 However, while I wasn't sure the only photo of Kellman I had would be high enough quality to fit that position, ultimately I couldn't find a decent photo of a Cyberman suitable for the design, even from screngrabs from the serial itself. So what I thought might be a straightforward composition had to go back on the drawing board until I could think of another way of doing it. So it was that other cover ideas come to mind first and 'Revenge' has ended up being the last of the 2010 releases to get done. Although starting from scratch, I was still thinking along lines of using shapes within which to arrange the characters, as I had done on 'Silver Nemesis', and the obvious thing to use was the outline of the Beacon. This led me to spending some fun time skipping through the DVD for shots of the plan of the Beacon in the control room and reproducing it as accurately as possible in Illustrator. I'm confident the result is pretty true (bar the room numbers which were too small to read) -- and you can click here to download an EPS of the full plan -- but wasn't sure I'd even use it on the cover, thinking at the time that just the outline shape would be enough. As usual, I put together a rough composition (right) to see how the figures would fit and which pictures worked best. There was only one decent shot of the Doctor from this story but it's a great image that I always planned to use anyway, and I had a good size version to scan from the cover of DWM #97. I did end up having to use a Cyberleader screengrab even with the new composition (it's surprising how few Cyberman photos there are given it was their first appearance after some six years), but figured that because they're smooth and the helmets at least can be broken down into fairly simple shapes, I'd be able to improve the image quality sufficiently. At this stage I wasn't certain I'd stick with having Kellman on the cover or whether Vorus would be enough, but liked the idea of him appearing and for the moment felt he filled a bit of a space. Happy with the rough, I began on the final illustration. Rather than my usual cover-shaped template, I began this one with a square canvas as I thought I might have some radial effects and these are easier if you can keep your origin in the centre, as shifting the focal point of a radial blur in Photoshop is pretty inaccurate (as you can see from the rough, the Beacon would be off-centre vertically in the cropped final cover). Click here to see the full final illustration. I imported the Beacon outline from Illustrator and backed it with a tinted shot of the control room. From the rough you can see that for the background I had used a shot of Tyrum's office on Voga and added some stars into the dark areas. This felt a little clumsy so I created radiating panels (again in Illustrator -- much better for geometry than Photoshop is) for alternating space and Voga scenes. This struck me as giving the design a rather Alister Pearson-esque feel, which appealed, so from this point on I approached the illustration with a sense of how he might do one of his covers. With that in mind I decided I would use the plan of the Beacon over the control room after all, as Alister was fond of using set design elements in his compositions. I strayed a little, perhaps, in keeping some of the Voga set to texture the gold segments, whereas I felt Alister tended to keep his backgrounds as flat colours, but kept it fairly subtle. I also overlayed the starscape with some wispy nebulae, which started out a deep purple but later became redder to match the Doctor's jacket. At this point I did spend some time creating some effects radiating out from the Beacon, inspired by some of Alister's earlier paintings, but in the end I removed them as they were too much and a technique Alister himself moved away from. Moving onto the foreground figures, the Doctor was pretty straightforward, tidying up the scan. I worked to add more definition to his face, as the shot had quite bleached out highlights (as does the equivalent in the DVD's photo gallery, so the original transparency must be like that). I used a bit more finger painting on this than I ordinarily would, partly because it needed it but also to give a more painted feel as part of my Pearson homage. 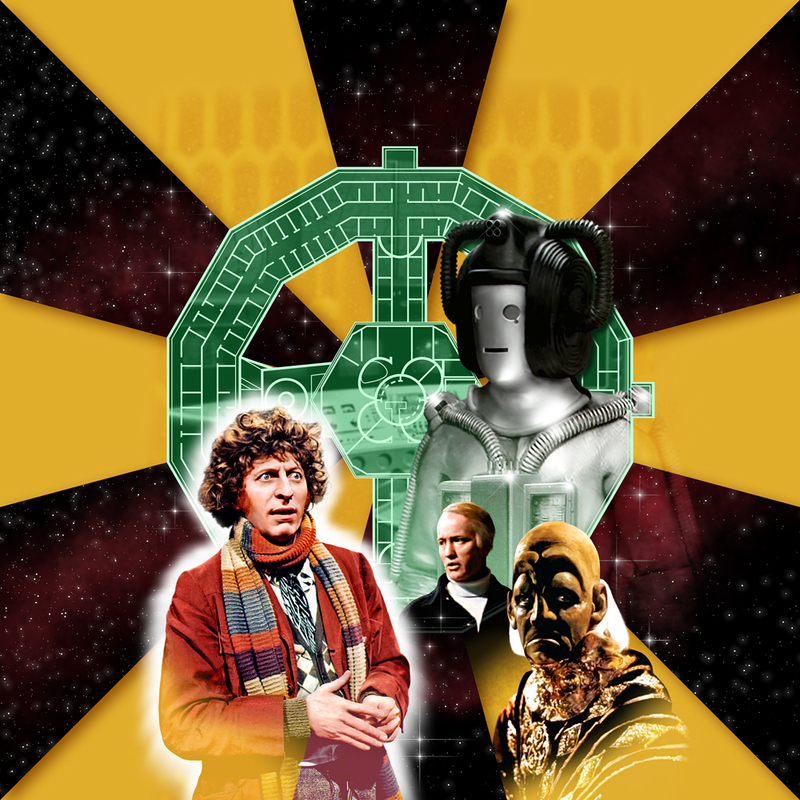 With this in mind, I also added some background colour tinting into the bottom edge of the Doctor, whereas usually he sits 'above' the rest of the cover illustration, but felt I had to retain his glow for consistency with my other covers, even though it's not something Alister would add. To clean up the Cyberleader screenshot, I created paths around the elements on his head (ears, earmuffs, face, headband, forehead and neck) so I could select and touch up each individually. I then did the same for his eyes and mouth to give them sharper edges. For the body I just used blurring and finger painting to try to regain some definition (only partly successfully on the tubes, I feel) but for the chest unit I used a different screengrab -- a close-up of the Cyberguard when he gets the signal after the Doctor has grabbed a cyberbomb. Finally in went Vorus, again faded into the background gold segment, and as you can see I kept Kellman as I liked him sitting between the Cyberleader and Vorus, as he does in the story.